Just getting into the setup, full license, tools are generally working. But... 1) Open blank LayoutEditor window; layer table texts are large (~2X the banner pulldown texts and the mouse-button descriptions) to the point that they are cropped off - I see a bunch of "layer 1" which are really layer10, layer11, ... and I can find no way to alter the text size in the Layer subwindow. Resizing the border rightward is not possible, although a bar-arrow appears as if it should (just does not move). Also the mouse-button texts are similarly cropped (see "make act" rather than "make active" and so on. I am on a 4K display using 200% scaling for text & apps; at 100% the pointer gets smaller along with the banner text, but the layers and mouse-prompt texts remain too large. How can I modify the displayed text font, for specific subwindows? 2) In the Layer Manager I have the opposite problem. layerName text is minuscule and no evident font control. Layer number field text size is good. Column headings are truncated front and back with only center couple of characters displaying. The "na" (name?) field is very wide and will not adjust width. The two columns to the right seem to not be editable or resizable, text is illegibly small (and again does not respond to OS text scaling). The "mapping" column for some reason displays the whole name but is not editable. 3) Cannot find where to assign the datatype (I have about 6 datatypes per layer in this foundry PDK which I am trying to convert by hand). The layer manager help entry has nothing to say about this? If there is a deeper document about setting up technology and modifying the display details (such as subwindow font sizes) please point me at it? Thursday 11th October 2018 I find this in the Helpdocs, re datatype: Datatype* A datatype is a additional number which can be stored which each primitive element (path, box, polygon, text). It is commonly used in two areas. First it is used in e-beam exposure of photo masks. (only in sharp beam system, not in gaussian beam systems) Here a different exposure energy is needed for each element to achieve exact image. The datatype field is used the store the exposure energy. The other application where the datatype is used is an extension of layers. Early layout system had a hard restriction of the amount of layer. To increase the amount of layers the datatype was used. Also it is used for a more exact description of an element. It describes whether the element is part of a conductor, capacitor, ... or just a label. For the last application it may be interesting to split different datatypes on different layers. This is supported by the layout editor. Activate it via the Setup Dialog and configure it via the Layer Manager. * But I cannot find any mention of datatype in the Layer Manager nor the Layers Setup nor general Setup. The above text seems to indicate that datatype would be a property of an individual object. What I want is a layer+datatype pair as is normal in a GDS file, carried back into the layout layertable. For example there might be a Met1 layer, datatype=0 for regular drawing, which the mask shop would apply a sizing to, and a Met1 datatype=1 for fab structures which should be printed as-is. Here's an example of what the foundry uses: LAYER NAME GDS # - TYPE LAYER DERIVATION - - - Contstruction Layers 1 - - Error Layer 99-1 Drag Box Layer 99-2 Origin Layer 99-3 Grid Layer 99-4 Text Layer 99-5 Cell Outline Layer 99-6 Cell Pin Name 99-7 - - - Device Layers - - MINTUB X 99-8 NBURIED 2-1 NBURIED SCRIBE 2-2 NBURIED LABEL 2-3 NBURIED TFORK 2-4 PBURIED 3-1 PBURIED SCRIBE 3-2 PBURIED LABEL 3-3 PBURIED TFORK 3-4 It would be tedious and error-prone to have to manage datatypes on every polygon of the design (if they are diverse). On the other hand this foundry's plethora of "purposes" seems a bit over-the-top. I guess what I really want to know is, can or can not the layertable itself, have layer and purpose fields connected to a layerName - if so, how? Thursday 11th October 2018 What operating system you are using? (Windows 10, Mac OSX 10.14, ....) And which version of the LayoutEditor? With the last update some adjustments for a correct display with high resolution/retina displays were made. But even before i never saw such a displaced user interface. The default text size in the dialogs is taken from the system. If you open the integrated text editor in the LayoutEditor, you can adjust the default text size with a Control-Key + mouse wheel move. (like in most other editors/browsers) After a LayoutEditor restart this new setting will applier to other text in the hole user interface as well. In case your font size is to big to be completely displayed in the subwindows like layer names or mouse help, you can grab the edge of the subwindow and make it wider. Thursday 11th October 2018 In the LayerManager next to the layer name on the right you have the setting for the layer/datatype mapping (the label is not readable with your display). 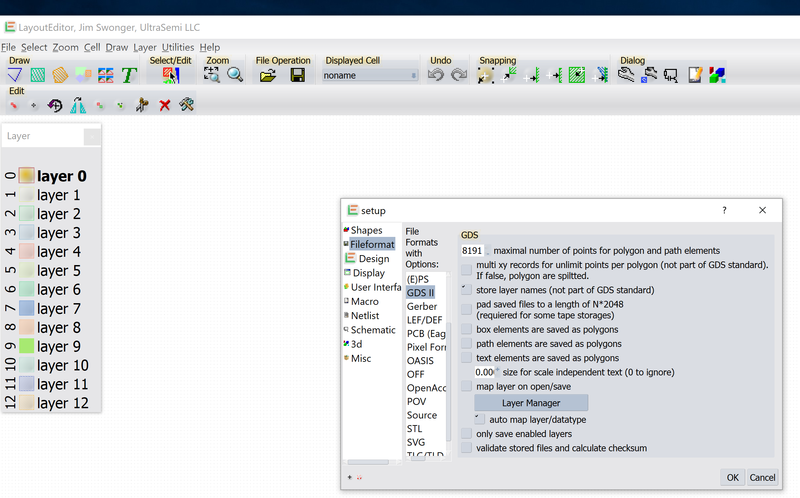 If you have enabled layer/datatype mapping in the setup for GDS or OASIS you can adjust this setting and move some datatype of an GDS layer to a different LayoutEditor layer. This is Windows 10 Professional, 4K display (Dell PrecisionM4800) and the layouteditor version is release 20180804. I see the GDS options have an "auto mapping" checkbox, is this what you mean? There must be something else behind it, to do the actual mapping of layouteditor layer to GDS layer / datatype pair? When I check that box, nothing seems to change in the layer manager (still says layernum and "all" for GDS / OASIS Mapping columns, which are unmodifiable (probably set someplace else, = ???). Maybe you can tell me where to find info on setting up layer mapping? Is this a thing that needs to be done in a macro rather than the GUI? I see that deep under the Utilities>Macros>Technology>opencelllibrary there are several technology macros, maybe you can lay out for me (heh) what the setup / startup macro chain might need to be in order to stand up a new technology w/ layers, extraction, DRC etc.? Strangely, the layer chooser window texts and the layer manager texts have gotten more sane today, and I don't have any idea why. I found the only way for me to get into an internal text editor is to open a macro file (?) and I can vary the text size there as you say. However it seems not to affect the layer chooser or layer manager windows' text (have quit and restarted, to see). Friday 12th October 2018 To use the *auto map layer/datatype* feature you need to enable the *map layer on open/save* feature as well. With the automap a *file/open* of a GDS will put any layer/datatype combination of a GDS file on a different LayoutEditor layer. The mapping in the LayerManager will be set. Under utilities/technology/openCellLibrary you will find a layer setup macro for this example technology. It includes an connectivity setup and DRC macros are next to this macro. However this example technology does not use any datatypes. When you change the font size with the integrated TextEditor the default text size in the hole application is updated with the next LayoutEditor startup. I will do some test with Windows10 and a 4k displays to reproduce what may happened on your system. Friday 12th October 2018 I imported a GDS file from the foundry and have gotten the "auto" layers table & saved the macro. This helps a lot. Now I would like to fix the ordering (which seems to be random, altogether). 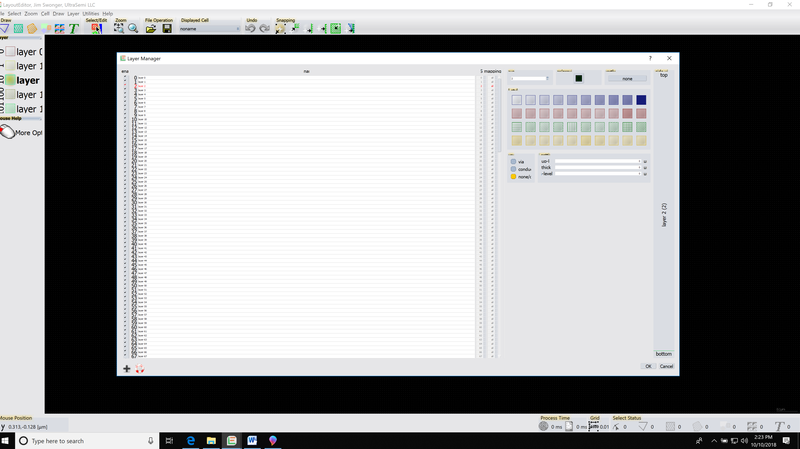 Can't see any draggability in the layer manager GUI. Perhaps I should just re-scramble the text in the macro file manually? Another question re layers window and menus and manager. The "Layer" window only shows 12 layers and will not drag-resize although the cursor indicates it could, when hovering at the edge. The Layer menu segments things into 0-31, 32-63, ... (and this seems like it offers access to layer info that is better than the Layer Manager). How can I manipulate the displayed layers (choose which, shorten / lengthen displayed list, reassign order, ...)? Friday 12th October 2018 In the layer subwindow the layer can be order by layer name, 3d level or by layer number. The sorting by layer number is the default after startup. When using the automapping the layer numbers are not sorted. As you proposed if you need a special order, sorting via a technology macro may the the easiest way.The number of visible layer in the layer subwindow depends on the windows size and the font size. If you prefer, you can only make the layer button visible without the name. In this case you should be able to view all existing layer as once. As setting on displaying the layer window can be adjusted by a right click on the layer window. Saturday 13th October 2018 I imported a GDS file from the foundry and have gotten the "auto" layers table & saved the macro. This helps a lot. Now I would like to fix the ordering (which seems to be random, altogether). Can't see any draggability in the layer manager GUI. Perhaps I should just re-scramble the text in the macro file manually? Another question re layers window and menus and manager. The "Layer" window only shows 12 layers and will not drag-resize although the cursor indicates it could, when hovering at the edge. The Layer menu segments things into 0-31, 32-63, ... (and this seems like it offers access to layer info that is better than the Layer Manager). How can I manipulate the displayed layers (choose which, shorten / lengthen displayed list, reassign order, ...)?